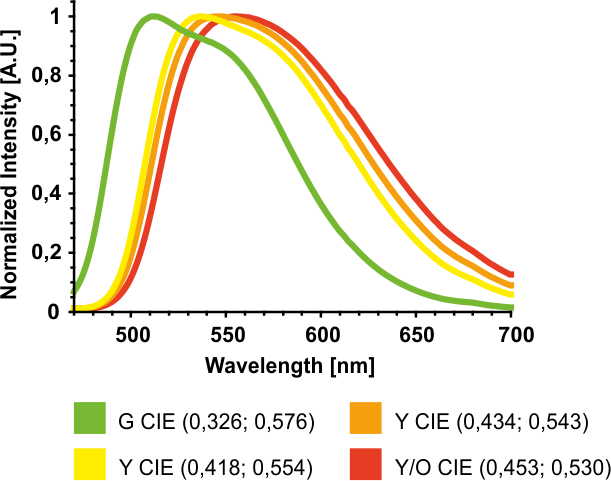 Single crystal YAG luminophore presents a smart, sophisticated and highly efficient solution for light wavelength conversion of blue InGaN light emitting diodes. 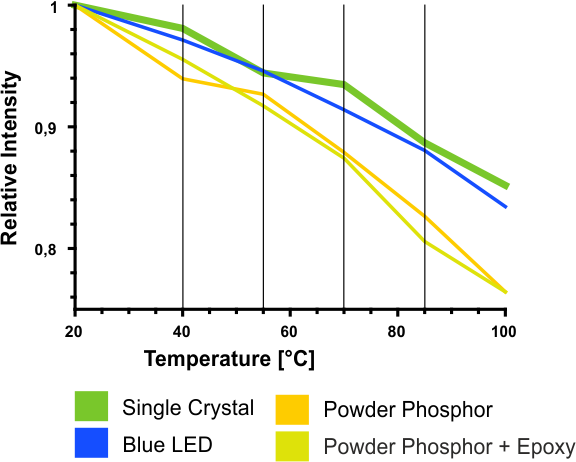 Cryphosphor delivers the best performance in high power LEDs with high efficiency. 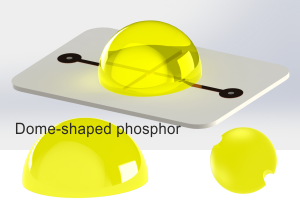 Unlike powders and polycrystalline materials where grain boundaries in the phosphor divert light beams in unwanted direction, light generated in single crystal phosphor needs to overcome only one boundary on the way out of the phosphor. Cryphospor does not suffer from parasitic absorption. High thermal conductivity of the phosphor itself helps to drain the excessive heat away from the chip. The chip also does not suffer from additional heat generated by backscattered light. This contributes to a reduced chip deterioration and longer service life of the LEDs. 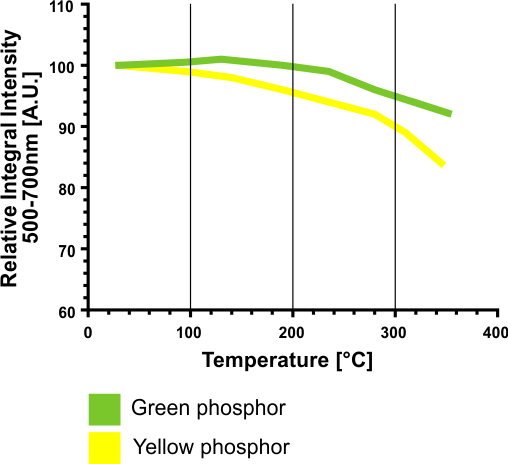 In comparison to alternative phosphors, cryphosphor generates more light event at higher temperatures and avoids LED darkening. Monocrystalline phosphors are produced with constant characteristics even throughout high volume production. Every batch is almost identical which contributes to overall production efficiency and cost optimization by eliminating the need to sort and categorize manufactured LEDs by their luminescence performance. Cryphosphor can be tuned to give the most radiance in different parts of spectra. 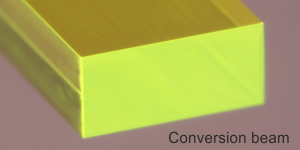 Phosphors can be manufactured and batched by desired spectral characteristics with CCT 5000-7000 K.
Physical characteristics of single crystal YAG also make it an ideal protective element of the LED chip due to its resistance to scratching and thermal degradation. In terms of cost per unit, monocrystalline phosphor is comparable to other available solutions. Easier manipulation also leads to cost reduction through manufacturing efficiency improvement. Cryphosphor can be tailored to fit the LED construction and design of resin-free high power LEDs or deliver high performance in applications requiring full color conversion. Standard phosphor sheets for CCT 5000K to 7000K are delivered on wafer frames or in wafer packs with quality inspection and binning performed for each piece. Cryphosphor can easily be applied by a pick and place robot over single or multiple LEDs. 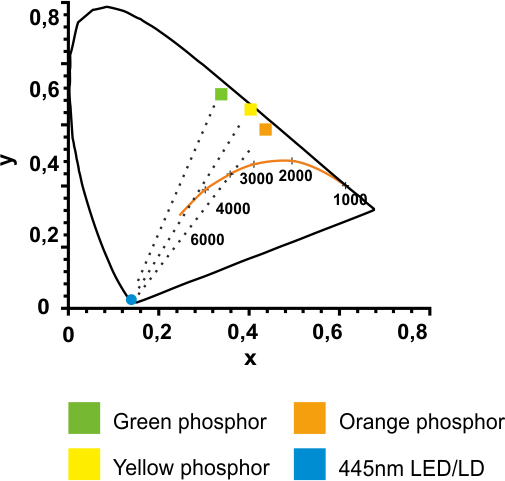 Dome-shaped phosphors provide an overall combination of a phosphor and very high external quantum efficiency. 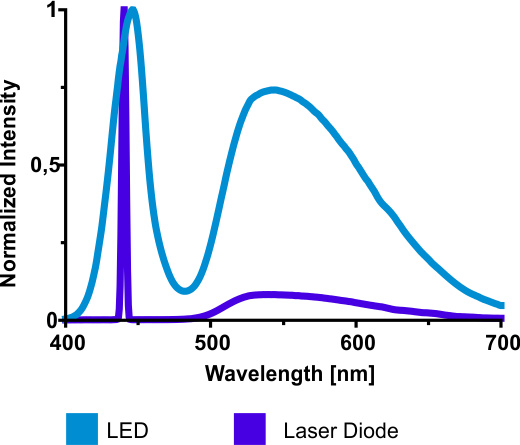 This type of phosphor provides efficient full light conversion from blue LED or LD to green, yellow or orange color. Precise dimensions, high quality surfaces and free-of-defects material result in a new type of phosphor which finds application as full-fledged optical elements or light guides. Such components can be incorporated as a part of SSL module optics. Crytur provides the integrated solution for processing small dimension crystal sheets in high volumes. Strictly controlled growing process, precise machining and fine finishing are essential for achieving homogenous high quality production. Crytur‘s proprietary patented crystal growth technology (W02012110009(A1)) makes high volume production available at competitive cost. Dimensions are customized upon request according to LED design and physical characteristics. Production range covers sizes from tenths of microns to units in millimeters. Standard phosphor plates are 1x1mm wide and 200µm thick and phoshor half-domes are 1mm in diameter.